An excerpt from Grant Macewan’s delight book, Blazing the Old Cattle Trail, Fifth House; Revised edition, 2000. York Factory, Hudson Bay, Canada. It is located about 600 miles north of Winnipeg, Manitoba, know as Fort Garry in 1830s. Fur Trader Anthony Henday, after a notable trip through the unknown parts of Western Canada in 1755, returned to York factory, on Hudson Bay, with hard-to-believe tales about his adventures. Having penetrated into what is now Western Alberta, he was the first white man to see the Canadian Rockies and, still more astonishing to his Hudson Bay Company friends, to report seeing the Indians riding horses. Although his listeners had doubts, Henday was reporting truthfully. Natives of the Blackfoot tribes had recently acquired horses, mainly by theft from their more southerly neighbor’s. Hence, the white man had nothing to do directly with the introduction of horses to Western Canada. But the local horses were not appreciated. To most people they were ugly and spiritless. Sharing that view, Governor George Simpson wrote: “some plan must soon be fallen upon to increase our stock and improve our breed of horses as they are becoming very scarce and of such small growth as to be quite unfit for our work. “We should select good mares from the United States and from the stock at our own posts,” the governor added, “and get a superior stallion from England.” The result, he hoped, would be heavier horses for farming, and faster horses for buffalo hunting. 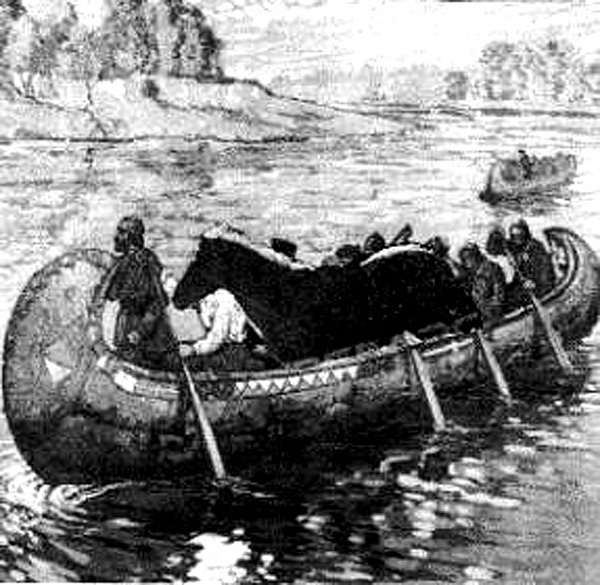 A rendering of Fireaway being brought down the chain of rivers and lakes to the Selkirk Settlement. That stallion was the famous Fireaway. On arrival at York Factory in the summer of 1831 he was transferred immediately to one of the oar-propelled York boats used on the route between Hudson Bay and Fort Garry. Hay and oats were carried but there were the many portages, at each of which the horse had to be unloaded and reloaded. It wasn’t easy and the horse didn’t like it any better than the men who were obliged to sit at the animal’s feet. Once the great horse fell out of the boat and swam to shore where he was caught and reloaded. Notwithstanding the numerous hazards created by a horse struggling constantly to balance himself in moving boat—call it a freight canoe or York Boat—George Simpson could report, ultimately, to London that the stallion “reached the settlement in perfect safety … and will soon give us a better breed of horses. He is looked upon as one of the wonders of the world by the natives, many of whom have travelled great distances with no other object than to see him. For the breeding season following, twenty-five selected mares were brought from Athabaska River to Fort Garry and Twenty-five from Fort Carlton—long trail by any standards. In due course there were foals bearing the clear marks of superiority; and in the years that followed, the maturing Fireaway horses came to be regarded as the swiftness buffalo runners and the most useful road horses in the country. Indeed, for 50 years thereafter the settlers of Red River talked about the speed and endurance of Fireaway stock. 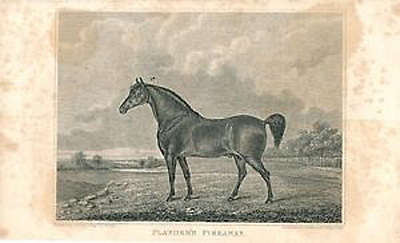 A horse know to be a great-grandson or great-granddaughter of Fireaway was likely to command a substantially better price than a horse of equal quality and unknown breeding. Macdonald was plowing with a two-horse team when the exhausted courier reached him. Reluctantly, he unhitched the good mare and her mate from the walking plow, hitched them to his democrat and drove to Portage. Farmers and townspeople couldn’t honestly expect a homesteader’s plowhorse to win a race against a barnstorming flier from St. Paul but they recalled her breeding and nursed a silenthope. It was a great race; every pioneer who saw it agreed and, sure enough, the blood of Fireaway was still virile if not invincible and Macdonald’s mare, drawing a farm democrat and an exultant Scottish settler, came down the Portage la Prairie Street to leave the professional racer from Minnesota a convincing distance behind. 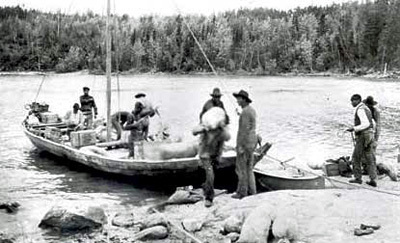 Men talked again about the greatness of Fireaway forgotten were the heroic men who accepted the nigh frightening task of bringing stallions from Hudson Bay to the as the location of Winnipeg when there was no means of transportation than a freight canoe. Where did the famous stallion go ultimately? On that point there was speculation. According to one story, he was sold to a United States buyer; another report poll of the horse being stolen and whisked across the boundary, and still another, that his breeding worth he became so well established that he was taken back by way of Hudson Bay to England where he was used to produce steeple chasers.